Last week’s workouts felt strong. Maybe it was the sunshine and spring temperatures, or maybe it was the start of the second trimester. 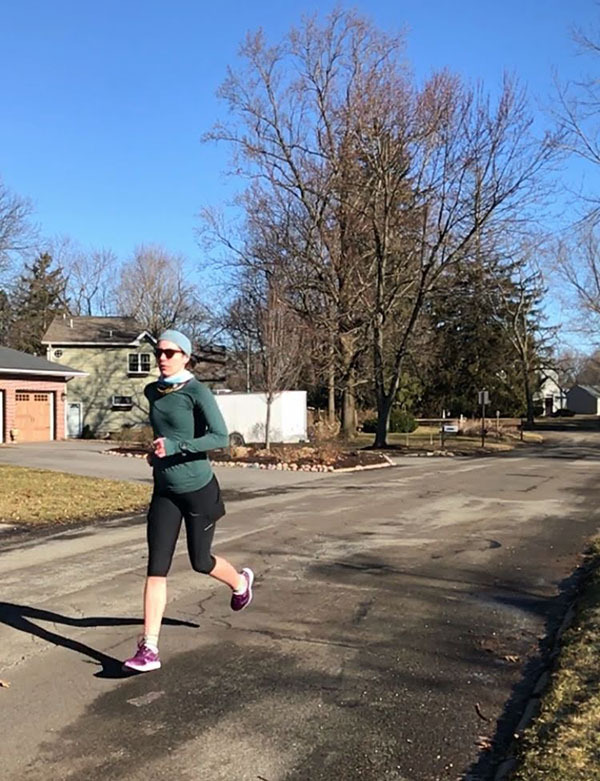 I ran the highest mileage of this pregnancy – 32 miles! – and felt good. I’m starting to experience the pregnancy slowdown but that doesn’t matter to me as much as how I feel. I don’t feel slow or short of breath yet. Running feels really, really good right now. I overhauled my approach to strength training this week. I need to focus on strength training more frequently. My goal is two shorter lifting sessions of about 15-20 minutes and one Pilates session. 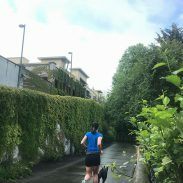 My recovery rate is changing as pregnancy progresses, so I’m returning to my old habit of strength training on run days rather than non-run days. I tried my short sessions immediately after runs this week. Monday was a beautiful day, with clear blue skies and mild temperatures! These are the days when running feels amazing. Rather than aiming for an exact time or distance, I planned this run by our route. Ollie and I ran to a 1.5 mile loop, did two laps around the loop, and ran home. It was nice for an easy run because I went on autopilot and did not look too often at my watch. We ran 5.9 miles and enjoyed every minute of the sunshine. I structured my workout as 15 minutes at tempo effort, 2 minutes recovery, then 2 x 10 minutes at tempo effort with 90 sec recovery for a total of 35 minutes of tempo effort. I am starting to experience the pregnancy slowdown. 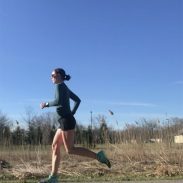 I’m still really happy with these paces; I’m simply observing they are slower than pre-pregnancy (and pre-fracture) when I ran a half marathon at 7:15/mile. I started off the first interval at a 7:25/mile pace, which felt great. I started to fatigue quickly, and the same effort dropped to 7:30 and then 7:35 for the next two intervals. I never felt like I was pushing too hard. It’s interesting because tempo effort feels comfortable, but my body can’t sustain it for as long as it used to. Nor do I feel like I could go much faster, even though I’m at about a 7 out of 10 effort. It’s incredible how smart the human body is! After the run, I completed a short mini band circuit with monster walks, lateral band walks, banded squats, banded single leg bridges, side planks with knee drives, and push-ups (modified to on my knees). I have not switched to prenatal Pilates yet. My doctor said as long as it’s comfortable, I can keep doing normal Pilates. If something does not feel comfortable, I modify it. Even the supine movements are okay until they feel comfortable since blood is flowing more during exercise and I never spend too long completely on my back. 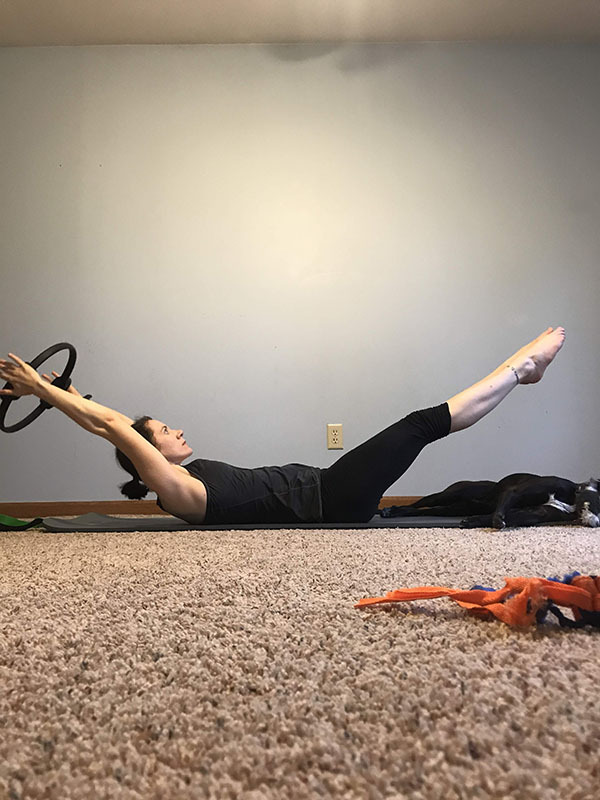 I did a magic circle workout for 20 minutes and spent 10 minutes following a Pilates stretching video. Seriously, even a short run makes a difference. I had a couple of days not feeling well mid-week until I started taking more Gas-X (I’m not going to sugar-coat pregnancy here – half the time I think I have a bump, it’s just bloating). This run, even through the fog, wind, and rain, granted me a 35-minute respite from feeling like crap. I probably could have run for longer, but I wanted to keep it short just in case I did a long run on Friday. I am absolutely obsessed with green smoothies this week. 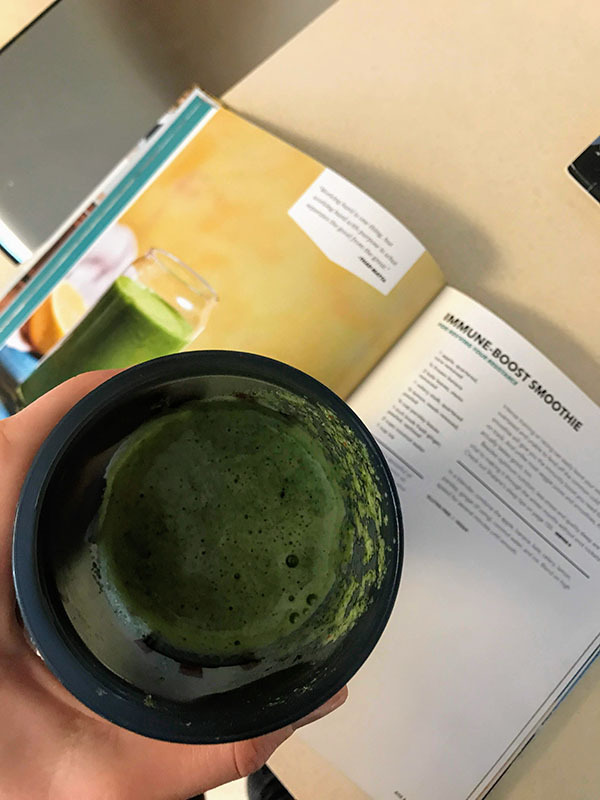 I make the Immune Boost one from Run Fast, Cook Fast, Eat Slow since is full of vegetables and uses coconut water. 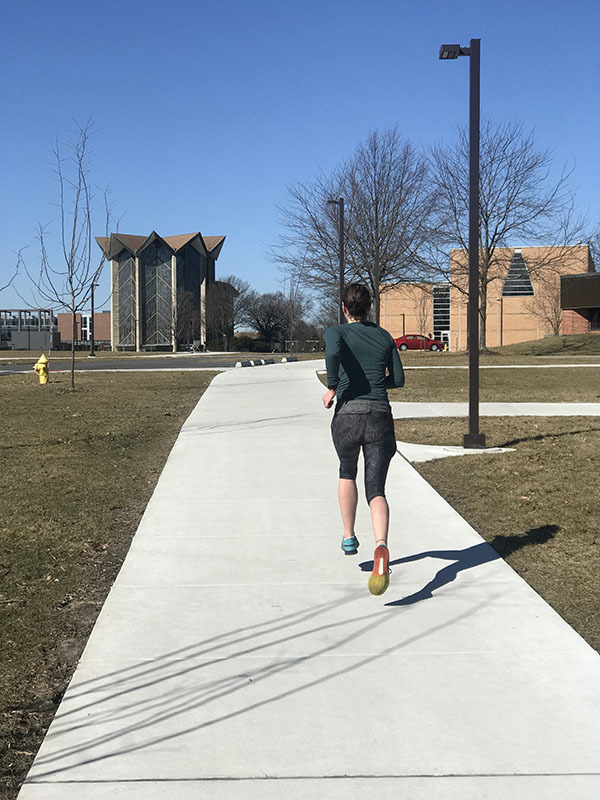 Just as I started feeling the pregnancy slowdown, I had a run that made me feel strong again. 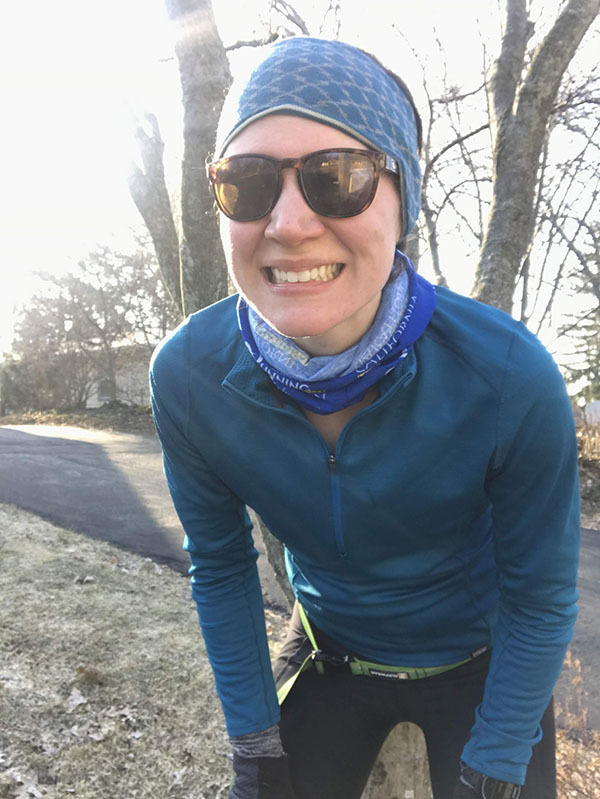 The run itself felt fantastic and energizing, especially thanks to 40 degree temperatures and sunshine. I maintained an easy effort for most of the run, especially with 25 mph gusts. In the final mile, I turned into the tailwind and decided to pick up the pace. I was surprised to see the final mile clock in at 7:15! Saturday morning was beautiful – forty degrees and sunny! Ryan and I ran around downtown and university again. While northwest Indiana is not hilly, this route has a few more rollers than my normal daily route. We kept our pace easy and enjoyed a nice spring run. After the run, I squeezed in a short strength circuit of kettlebell squats, single leg deadlifts, bent over rows, deadbugs, and full pushups. My body appreciates complete rest days more than ever. And finally, for the first time in weeks, I didn’t feel awful on a rest day. Do you prefer longer or shorter strength workouts? Nice work! I remember daily thinking – have I popped or am I just bloated – with my pregnancy. Lol! I even wondered that during the late 3 trimester. Now when I look at pictures it’s clear I was very pregnant and not bloated. Lol! Thank you! I’m glad it’s not just me who gets the two confused! Hopefully soon it will be more than just bloat? Thank you for hosting! A long strength session can feel so rewarding! Excellent job! I could not run during both of my pregnancies. I was just so exhausted. I did continue my strength training and I did a lot of walking. I’m always so impressed at runners who can keep going! Thank you! What’s so funny is that strength training tires me out so much now, which is one of the reasons I switched to shorter sessions and less weight. I’m so impressed with women who continue to strength train like normal during their pregnancies! Nice work this week Laura. I am so happy to hear how good you are feeling during your pregnancy. 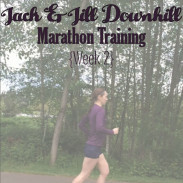 I was never really able to do much running during my pregnancies due to complications. Don’t you also love that burst of energy once that first trimester ends! Keep up the good work! Thank you! The energy burst is even more noticeable this week, which is amazing! Thank you! I am really lucky to have a relatively easy pregnancy so far (minus the daily indigestion and bloating) that allows me to run. Thank you! Short strength sessions do keep boredom at bay! Thank you for hosting. I have heard many great things about that cookbook. I keep telling myself to get one for me. You had a great week of runs and workouts. Awesome! Thank you! I use that cookbook so often, even more than the first one. It was around the start of the second trimester that I felt my best too- the first trimester nausea eased up and running still felt relatively comfortable. Great job in those runs! !